The Philadelphia Society will be meeting next week, October 4-5, in Atlanta for a conference on "The Permanent Things," which celebrates the 60th anniversary of the publication of Russell Kirk's The Conservative Mind. I will be on a panel on "Human Nature and the Permanent Things." Here's the text of my remarks, which consist largely of excerpts from my article in the Fall 2010 issue of The Intercollegiate Review. If we accept evolutionary science, then human nature is not one of the permanent things. But it is one of the enduring things. And that’s enough. An evolved human nature that is enduring but not permanent is enough to support an evolutionary conservatism rooted in an evolutionary moral anthropology of natural desires, customary traditions, and individual judgments. That’s not enough, however, for a metaphysical conservatism that appeals to a transcendent moral cosmology of eternal order as intelligently designed by the Creator. This contrast between evolutionary conservatism and metaphysical conservatism was displayed in the debate between Friedrich Hayek and Russell Kirk at the 1957 meeting of the Mont Pelerin Society. Kirk had stated his metaphysical and religious conservatism in 1953 in The Conservative Mind. The first canon of conservative thought, he declared, was “belief that a divine intent rules society as well as conscience, forging an eternal chain of right and duty which links great and obscure, living and dead.” Consequently, “politics is the art of apprehending and applying the Justice which is above nature.” Kirk spoke of the conservative belief in “a transcendent moral order,” and in Edmund Burke’s “description of the state as a divinely ordained moral essence, a spiritual union of the dead, the living, and those yet unborn,” and Kirk also spoke of Burke’s view of history as “the unfolding of Design.” Kirk warned against Darwinian evolutionary science as undermining this metaphysical conservatism because it denies the religious belief in a transcendent moral order of intelligent design. In this same tradition of metaphysical conservatism, Richard Weaver insisted that a healthy cultural order required a “metaphysical dream of the world,” so that people could imagine their cultural life as a “metaphysical community” fulfilling a cosmic purpose. Like Kirk, Weaver worried that Darwin’s theory of evolution denied this “metaphysical dream” of cosmic order by explaining human beings as products of a natural evolutionary process governed by material causes that were not directed to any cosmic purposes. Consequently, in the Darwinian view, human cultural order was deprived of any transcendent meaning because it could not be seen as serving the cosmic order of the Creator’s intelligently designed universe. Since Hayek accepted Darwinian science but doubted the existence of God, he disagreed with Kirk’s metaphysical conservatism. This led Hayek to insist—at the 1957 meeting—that he was not really a “conservative” at all, but a “liberal” in the classical tradition of Burke and the Old Whigs. He objected to the “obscurantism” of a conservative attitude that rejected Darwin’s theory of evolution as morally corrupting. He elaborated his view of Burkean liberalism as belonging to a British empiricist evolutionary tradition contrasted with a French rationalistic design tradition. In the evolutionary tradition of David Hume, Adam Smith, and Burke, Hayek explained, “it was shown that an evident order which was not the product of a designing human intelligence need not therefore be ascribed to the design of a higher, supernatural intelligence, but that there was a third possibility—the emergence of order as the result of adaptive evolution.” He then suggested that Darwin’s theory of biological evolution was derived from the theories of social evolution developed by the Scottish philosophers. That both Kirk and Hayek appealed to Burke suggests that they were both Burkean liberal conservatives. But their disagreement reflects a tension within Burke’s political thought, with Kirk embracing the metaphysical side of Burke’s conservatism, and Hayek embracing the evolutionary side. Any renewal of evolutionary conservatism will provoke criticisms from the metaphysical conservatives. From my experience in defending Darwinian conservatism, the most common criticism is that the naturalist morality of Darwinian science must fail, because a healthy moral order depends necessarily on religion, and particularly on the biblical doctrine that all human beings are created in God’s image and thus endowed by their Creator with equal moral dignity. For example, my critics have argued, the moral condemnation of slavery arose from a religious metaphysics that saw slavery as contrary to God’s law. A purely naturalistic Darwinian morality would not have taught us that slavery is absolutely wrong. But is this true? Darwin was a fervent opponent of slavery. Like Hume and Smith, he saw slavery as a violation of the moral sentiments—particularly, those sentiments that enforce justice as reciprocity. From an evolutionary perspective, slavery is a form of social parasitism. And since human slaves are not naturally adapted to their enslavement, they will resist exploitation, and slaveholders will have to impose their rule over their slaves by force and fraud. In the effort to justify slavery, American slaveholders espoused a fraudulent ideology of paternalism that claimed that the slaves were naturally benefited by their enslavement. The proslavery ideology in the American South asserted that black slaves were physically, morally, and intellectually inferior to whites in their biological nature, and so these black slaves were happier when they were serving white masters. One of the primary motivations for Darwin’s writing of The Descent of Man was to refute this ideology of scientific racism by showing that all the human races were members of the same human species with the same moral sense that condemned slavery as exploitation. American Southern conservatives defended slavery as a conservative Christian institution supported by the Bible. In writing about Southern conservatism, in The Conservative Mind, Kirk warned that “human slavery is bad ground for conservatives to make a stand upon.” But he never answered the arguments of the Southern Christian conservatives that slavery was biblically sanctioned as part of God’s law. Richard Weaver admired the “older religiousness” in the American South before the Civil War, and he recognized that part of the Southern religion was faith in the Bible as supporting slavery. Weaver explained that slavery “is well recognized in the Old Testament, and it is not without endorsement in the New; indeed, a strict constructionist interpretation almost requires its defense.” So it seems that the “metaphysical dream of the world” in the Old South sanctioned slavery as part of God’s transcendent moral order. In such a situation, human beings must appeal to some natural moral sense like that espoused by Hume, Smith, and Darwin. Darwinian conservatives can explain this moral sense as rooted in evolved human nature. Unlike the metaphysical conservatives, who claim that all social order must conform to some supernatural order of intelligent design or divine creation, evolutionary conservatives see social order as the product of ordinary human experience as guided by nature, custom, and prudence. So as we celebrate the permanent things, let’s not forget the enduring things, which include the enduring human structure of instinctive evolution, cultural evolution, and individual judgment that gives us an enduring standard of natural right. For those of us who are Darwinian conservatives, that’s enough. In a long series of posts earlier this year (from January to April), I argued that the Darwinian aristocratic liberalism of Friedrich Nietzsche's Human, All Too Human (1878) is superior to the Dionysian aristocratic radicalism of his later writings. If Nietzsche had written only Human, All Too Human, Hitler and the Nazis would never have adopted him as their philosopher, because he would have been seen as a proponent of classical liberalism in the tradition of Eugen Richter (the leading German liberal in the Second Reich). Now I am again reading Human, All Too Human for my graduate seminar on Nietzsche, and I am again amazed that the scholars of Nietzsche's political thought give almost no attention to section 8 of that book--"A Glance at the State." This is the longest section in all of Nietzsche's writings in which he speaks about political institutions, and it's his strongest endorsement of liberal democracy. By contrast, in his later writings, he scorns liberalism as "herd-animalization" that "undermines the will to power" (Twilight of the Idols, "Skirmishes of an Untimely Man," 38). This is the Nietzsche embraced by Leo Strauss as leading the "third wave of modernity" in provoking the "crisis of liberalism," because he sees that liberalism promotes a base hedonism and egalitarianism that has no place for human excellence. In Human, All Too Human, Nietzsche defends an aristocratic liberalism based on the idea that a liberal culture cultivates human moral and intellectual excellence, including the Socratic life of the "free spirits" who live only for scientific inquiry. In "A Glance at the State," his reasoning for this can be summarized as six affirmations and six rejections. Affirming liberal democracy (438). Nietzsche accepts the modern triumph of democracy as combining democratic government, freedom of speech, and cultural pluralism. This liberal freedom protects the life of the Socratic free spirits, who are free to speak in public, although they normally prefer to live a private life of theoretical inquiry. All political parties are demagogic in their crude appeal to the masses, but this demagogic politics is no threat to the Socratic free spirits who enjoy the freedom of a liberal society. Affirming cultural aristocracy, but not political aristocracy (439, 465, 480). A liberal society allows for the emergence of free spirits as "higher men," who constitute a cultural aristocracy, but not a political aristocracy, because they do not wish to rule politically. Affirming the separation of church and state and the privatization of religion (472). Previously, governments were legitimated by divine right, by some claim that political authority was sanctioned by some religious or metaphysical cosmology. In a liberal regime, political authority arises by popular consent without any need for metaphysical claims. Metaphysical or religious beliefs become purely private matters, and there's a multiplicity of religious sects that are free to compete with one another. Affirming limited government and the "decline of the state" (472-73). Since a liberal government makes no transcendent claims, it is limited in its ends, so limited that much of its work can be taken over by private contractors, and thus state power declines. Affirming cosmopolitan globalization and liberal peace (475). Global capitalism promotes international trade in ways that foster a cosmopolitan culture and peace among nations, because warfare seems unnecessarily disruptive to global commerce. Affirming cultural evolution as a largely spontaneous order separated from the state (465, 474, 480). "Culture owes its highest achievements to politically weakened times." Liberalism separates culture from the state, and this fosters the moral and intellectual excellence of human beings by freeing them from political regimentation. Rejecting socialism (452, 473). Nietzsche forecasts that socialist states will have to employ terrorism in subjugating all citizens to absolute rule, which will provoke a reaction for reducing state power. Socialism degrades cultural life by suppressing outstanding individuals. Rejecting nationalism (475, 480). In Nietzsche's day, the nationalist parties were the opponents of the socialist parties. He rejects both because both use state power for the regimentation of culture, which denies the individual freedom necessary for the evolution of higher culture. Rejecting anti-Semitism (475). Liberal globalization will promote the "European man" as a "mixed race," and one benefit of this is that it will solve "the problem of the Jews," because the Jews will be part of this European mixed race. This is good because the Jews show a higher intelligence, having produced "the noblest human being (Christ), the purest philosopher (Spinoza), the most powerful book, and the most effective moral code in the world." Rejecting the illiberalism of the Athenian democratic polis and Plato's "ideal state" (474). Although the Athenian polis was democratic, it was illiberal in its statist supervision of culture, just like Plato's "city in speech" in The Republic and The Laws. Nietzsche rejects this because higher cultural life flourishes only when it is free from political control. Rejecting the aristocracy of the "Superman" (441, 461). While Nietzsche thinks a liberal society fosters the "higher culture" of "higher men," he rejects the idea that some human beings can become "superhuman" (ubermenschliche). He thus rejects the most famous teaching of his later writings--that the only alternative to modern democratic degradation is the noble rule of the "Superman" (Ubermensch). In Human, All Too Human, he repeatedly warns against the belief in the "superhuman" ability of the great "leader" (Fuhrer) as a dangerous delusion that will promote tyranny (143, 164, 441, 461; D, 49, 548). The history of the 20th century confirmed his prophetic warning. The Evolutionary Science of Rousseau's "Second Discourse"
In his "Discourse on the Origin of Inequality among Men," Rousseau thought that he had explained the evolutionary origins of war, property, and inequality. While he relied on the best anthropological evidence available to him, he looked forward to the time when scientists would take long voyages around the world to collect the evidence for human evolution that would allow them to write "the natural, moral, and political history" of humanity (translation by Roger Masters, p. 213). Over the past couple of centuries, that work has been done by biologists, anthropologists, and archaeologists, so that now we can write the social history of humanity foreseen by Rousseau, which allows us to judge whether Rousseau's account is true or not. Here, then, is an illustration of how the history of political philosophy can be studied as an empirical science. A brilliant compendium of that evolutionary political anthropology is Kent Flannery and Joyce Marcus's The Creation of Inequality: How Our Prehistoric Ancestors Set the Stage for Monarchy, Slavery, and Empire (Harvard University Press, 2012). Flannery and Marcus are prominent professors of anthropological archaeology at the University of Michigan. This book is especially good for assessing Rousseau's "Second Discourse," because the general theme of their book is that research in archaeology and cultural anthropology over the past 150 years largely confirms Rousseau's account of the origin of inequality. The epigram for their book is Rousseau's famous declaration at the beginning of the Social Contract: "Man is born free, and yet everywhere he is in chains." My conclusion, however, is that anyone who reads their book carefully and compares it with Rousseau's "Second Discourse" will see that most of his major claims have been refuted, and that the evidence today supports Locke's account of political evolution and thus supports Lockean liberalism. Oddly, Flannery and Marcus are completely silent about what Rousseau says about the first stage of human evolution--"the pure state of nature"--in which human ancestors wandered as solitary animals with no social bonds and no language. As I have indicated in my previous post, there is no empirical evidence for this. Even if we see Rousseau's natural man as an orangutan, we would have to see that even orangutans have some social structure in their lives. All of the anthropological and archaeological evidence suggests that for most of their evolutionary history, human beings have lived as nomadic hunter-gatherers for whom the largest social groups were extended families. Flannery and Marcus agree with this, and so for them the "state of nature" is the social life of nomadic foragers living in families. They thus silently throw out Rousseau's fantasy of solitary human beings in a state of nature, and they begin with Rousseau's second period of human history--the "nascent society" that arose with the establishment of families (SD, 146-50). Having silently made that one major modification in Rousseau's history, Flannery and Marcus suggest that what remains in Rousseau's history is a roughly accurate account of the origins of war, property, and inequality in human social history. Summarizing and integrating the work of hundreds of anthropologists and archaeologists, Flannery and Marcus divide this history into four parts: (1) hunter-gatherers with equality, (2) early agricultural societies with achieved inequality, (3) agricultural chiefdoms with hereditary inequality, and (4) finally inequality in kingdoms and empire. They conclude their book with their recommendation that we use this knowledge to resist inequality by asking ourselves: what would hunter-gatherers do if they were in charge? Flannery and Marcus agree with Rousseau that our earliest human ancestors were free from war, and therefore that war is not a natural human propensity but a purely cultural invention of agricultural societies and bureaucratic states (18, 32, 40-42, 55, 106, 109, 178-79, 226). So they are on the side of the Rousseaueans against the Hobbesians in the continuing debate over whether war was part of the human state of nature. According to Flannery and Marcus, war arose for the first time with the formation of clans, which created a xenophobic "us versus them" attitude that fostered the first group violence, which did not occur among clanless foragers. And yet they admit that there are some exceptions to this rule, because there were some clanless foragers that engaged in group violence--such as the Andaman Islanders (40-45). Flannery and Marcus are silent, however, about the fact that the Andaman Islands were one of the few areas where at least two societies of nomadic foragers had a common border and had no contact with pastoralists, farmers, or state societies. As Richard Wrangham and Luke Glowaki have argued, it is only in these circumstances that nomadic foragers can show their natural propensity to the same kind of warfare that one sees among chimpanzees. I have written about this in a previous post. So the evidence does not clearly support the conclusion that clanless foragers were free from war. It seems, then, that Hobbes and Locke were right about how easily the state of nature moved from a state of peace to a state of war. Although there was no property in Rousseau's "pure state of nature," Rousseau thought the establishment and differentiation of families would create "a sort of property--from which perhaps many quarrels and fights already arose" (146, 151). So, for example, he suggested that families would own their huts. Flannery and Marcus believe that foragers have always lived in families, and they seem to confirm Rousseau's point that families would claim some form of property. There is a sexual division of labor in which men hunt wild animals, and women gather wild plants. Hunting is risky in that the hunter can never be sure that he will be successful. So as a kind of insurance against this risk, foraging hunters are expected to share their meat with those who were unsuccessful in their hunt. But the gathering of food is not so risky, and so there is less need for sharing. And, indeed, the food gathered by the women is shared only with their own families (32, 36, 43). With the development of agriculture, property became more extensive. Farmers claimed ownership of what they harvested as being the fruit of their labor, and in some cases they could claim ownership in the land they farmed. The privatization of labor then created incentives for more intensive and productive agriculture (254-58). So it seems that Marx was wrong in believing that primitive societies were communistic in denying private property, and Locke was right in believing that individuals in the state of nature would claim ownership in themselves that would be extended by labor into ownership of goods. The evidence supports the Lockean liberal account of the evolution of private property. This same point has come up in a previous post. Rousseau recognized that even in the state of nature, human beings would be naturally unequal in age, health, strength, intelligence, and talents. But he thought these differences in natural potentiality would not be developed very far so long as human beings were not moved by an ambitious desire to appear superior to others (SD, 101, 127, 138, 140, 149, 155, 171, 174-75, 180, 201-202, 227-28). This desire for superiority over others and being admired by others (amour propre)--as distinguished from love of oneself (amour de soi meme)--was the cause of the social competition and the oppressive social hierarchy that arose after the invention of agriculture allowed the emergence of civilized societies. Flannery and Marcus agree with Rousseau about this. They think that nomadic hunter-gatherers showed the "self-respect" necessary for self-preservation but not the "self-love" that leads one to desire superiority over others and admiration by others (ix). They also think that foragers show natural inequality in "strength, agility, and intelligence," but that foraging societies are egalitarian in that people are punished for going too far in asserting their superiority over others. And yet they sometimes suggest that the desire for superiority was there at the beginning in hunter-gatherer societies: "Rousseau considered the replacement of self-respect with self-love an important moment in the creation of inequality. It now seems obvious, however, that both self-respect and self-love were there from the beginning. The tug-of-war between them may have been one of Ice Age society's most significant logical contradictions" (551, compare 66, 87, 97). Although they agree with Rousseau that as a rule the invention of agriculture was the great revolution that led to social inequality, they note that there are a few exceptions to this rule. We now know that there are cases--unknown to Rousseau--of complex foraging societies that established unequal social ranking. For example, there is archaeological evidence that foraging societies along the west coast of North America had social ranking with chiefs and their clans being superior over others (66-87). This suggests that the desire to be superior over others is natural even for foragers (87). Even Rousseau admits that amour propre appears as soon as human beings live in familial groups, and this is "precisely the point reached by most of the savage peoples known to us" (SD,149-50). Rousseau believed that the evolutionary history of society showed that the power of rulers over their subjects could not be legitimated by reason alone, and that rulers had discovered that they needed to pretend that they ruled by divine right--that political rule was sanctified by a religious cosmology (SD, 103, 154, 170, 172, 180). Originally, the first human beings had no rulers other than the gods, but eventually they were persuaded that some human beings could rule with divine authority (Social Contract, IV, ch. 8). Flannery and Marcus argue that the evidence from archaeology and anthropology confirms this (21-23, 30, 47, 54-65, 191-93, 198-99, 206-209, 212-13, 237, 241, 249, 254, 300-303, 333, 347, 409-16, 477-78, 561). Every society has some cosmological explanation for how human beings and their world came into existence, and this cosmological creation story provides moral sanction for their social order. Typically, the world begins as a formless chaos, and then some supernatural spirits create order out of this chaos, including the creation of human beings. This creation story constitutes the moral charter for a society because it provides a sacred origin for the moral rules of a society. And thus religious belief is an evolutionary adaptation for binding people together into social groups. Originally, among nomadic hunter-gatherers, the cosmological creation story sanctioned a celestial dominance hierarchy: the invisible supernatural beings were the alphas, the invisible ancestors were the betas, and the living human beings were the gammas. Therefore, originally, all living human beings were equal in their subordination to the invisible gods and ancestors. Inequality of social ranking arose when some living human beings successfully claimed that they or their clans were divine or divinely sanctioned for rule over others, and thus there was a cosmological justification for inequality (59-60, 65, 208-209, 301, 548, 563). Notice, however, that when evolutionary scientists like Flannery and Marcus offer such scientific explanations of the evolution of religious cosmology and creation stories, they expose the falsity of these religious traditions and thus subvert the religious support for social order. Does this show us how evolutionary science deprives morality and politics of any grounding in religious cosmology? Adopting the argument of anthropologist Roy Rappaport, Flannery and Marcus see three elements in such religious cosmology. First, there are some ultimate sacred propositions that must be considered absolutely true despite there being no empirical evidence to support them. Second, there must be rituals that repeatedly reinforce belief in these propositions through art, music, and dance. Third, these rituals are successful if they create emotional experiences of awe and fear that induce belief in the sacred propositions even without rational proof (57-58, 561). But notice, again, that in teaching us this, Flannery and Marcus are puncturing the magic of religious belief by exposing it as a mere magic trick. Notice, also, the ambiguity in this evolutionary story of the origin of inequality. On the one hand, Flannery and Marcus want to present the original state of hunter-gatherer society as one of complete equality. On the other hand, they intimate that even hunter-gatherer society shows an inequality that is only amplified in later social orders. "Our Ice Age ancestors temporarily put an end to leadership based on confrontation. As Christopher Boehm reminds us, the headmen of foraging groups were not bullies. They were generous, modest, and diplomatic, because their constituents were too skilled at alliance-building to put up with bullies. The fate of a bully was to be lured into the bush and shot with poisoned arrows" (59). So now they acknowledge that foragers had "headmen," which is why foragers had to work so hard to keep those dominant individuals from becoming bullies. In fact, Boehm's argument--in Hierarchy in the Forest (1999)--is not that foragers have absolute equality without any individuals in positions of dominance or leadership, but rather that they have "moderate leadership" by dominant individuals who are constrained by the disposition of others to resist bullying. This is what Boehm calls "egalitarian hierarchy." And, in fact, Flannery and Marcus repeatedly recognize that in forager groups, some individuals have more influence and higher status than others, because some individuals naturally desire to be superior, and that foragers do rely on some informal and episodic leadership, although this leadership is not formal and permanent (23-24, 32-33, 36-38, 44-45, 49-50, 54-55, 59-60, 75, 86-87, 94-97, 109, 112, 208-10, 547-64). For example, while foragers do not have a formal priestly class, some individuals will become shamans because they are especially skillful in religious story-telling and rituals. Boehm concludes from this that "utopian democrats" like Marx are wrong to think that we can have a completely equal society. But instead of that, Boehm suggests, we can see an approximation to the "egalitarian hierarchy" of our foraging ancestors in a modern liberal democracy, where ambitious people can compete for dominance, but they are constrained by constitutional limits, free markets, and liberal pluralism, so that subordinates are free from tyrannical bullying. (A similar kind of argument has been made by Jonathan Turner, Alexandra Maryanski, and Paul Rubin.) If so, then Lockean liberalism is vindicated. I have written about this in some previous posts. "It is no one's fault but our own if we allow our society to create 'nobles by wealth.' We can resist just as surely as any self-respecting !Kung would do. So the next time a pampered star tells you that his last film made him $20 million, tell him which charity to give it to. Then explain that you have not actually seen the film, but that you and your dog have discovered that the DVD makes a great Frisbee" (564). Actually, as Flannery and Marcus indicate in their book, show business began among hunter-gatherers, who rewarded superior singers and dancers (63-65). At least in a liberal capitalist society, we are free to choose how to reward or punish our entertainers. Was Rousseau's Natural Man an Orangutan? Jean-Jacques Rousseau's Discourse on the Origin of Inequality illustrates the dependence of political philosophy on the empirical science of evolutionary political anthropology. This is most evident in the notes to his book, which provide empirical evidence for the assertions in his text, evidence drawn from anthropological reports, comparative anatomy, animal behavior, and geology. In note j, which is the central note and the longest note, Rousseau complains that the anthropological reports by travellers on which he relies are not trustworthy because the travellers--sailors, merchants, soldiers, and missionaries--are not good scientific observers. He hopes that someday a rich man will provide the money to support a scientific genius in going on a ten-year voyage around the world, collecting information about human life in all parts of the earth, who then would return to write "the natural, moral, and political history" of humanity (Masters trans., 213). Beginning with scientific voyagers like Alexander von Humboldt, Alfred Russel Wallace, and Charles Darwin, Rousseau's proposed scientific research project has been carried out by anthropologists, archaeologists, and evolutionary biologists. So we are now in a position to judge whether Rousseau's account of human political evolution is empirically confirmed or not. Was Rousseau right about the state of nature, in which primitive human beings lived as utterly solitary animals, without language, inequality, property, or war? Was he right that in such a state of nature, "man is naturally good," because solitary individuals free from any dependence on others have no motive to be wicked (193)? To support his account of savage men in the state of nature, Rousseau cites reports about the Caribs of Venezuela (108, 117, 179), other American Indians in the New World (113), and the Hottentots of the Cape of Good Hope (113). The frontispiece for the book shows a Hottentot who has renounced his conversion by Christian missionaries, who strips off his European clothing, and who announces that he is returning to his Hottentot relatives: "I renounce also for my entire life the Christian religion; my resolution is to live and die in the religion, ways, and customs of my ancestors" (225-26). Oddly, this does not support Rousseau's view of the state of nature, because this Hottentot is obviously a social animal with kinship ties and social customs. The same can be said about the Caribs and the other American Indians. Moreover, the studies of evolutionary anthropologists over the past two centuries confirm that the first and longest period of human evolution was in hunter-gatherer bands organized around extended family ties. Thus, Rousseau's conception of the state of nature as utterly solitary with no social structure is clearly wrong. But then Rousseau suggests in note j that savage man in the state of nature was actually an anthropomorphic animal or an orangutan (204-209). He quotes one report about the orangutan being "a sort of middle point between the human species and the baboons" (204). 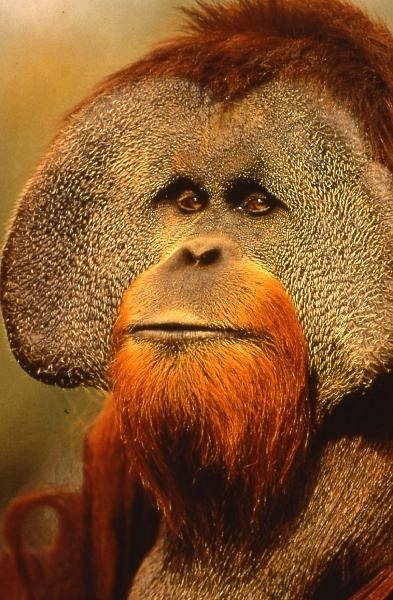 In Malay, orang hutan means "man of the forest," and in Rousseau's time, "orangutan" was a general term for any of the great apes, because no one had clearly distinguished the different species of apes. It was only much later that scientific observers realized that the orangutans found only in Borneo and Sumatra were a distinct species separated from gorillas and chimpanzees found only in Africa. And it is only in recent decades, that the bonobo in Africa has been recognized as a distinct species closely related to chimpanzees. Surprisingly, some of the reports about orangutans in the wild suggest that they might actually be living in Rousseau's state of nature. John MacKinnon, one of the leading observers of the orangutan, has described this ape as "an anti-social and solitary animal" and "a shaggy, surly bundle of complete inactivity." He lives by wandering through tropical rainforests in Borneo and Sumatra feeding at widely scattered fruit trees. The male usually travels alone. He mates on rare occasions; and although he may form a consortship with a female, this lasts no longer than a few days. The only stable social bond is between mothers and their infants, and typically adult females are somewhat social in contrast to the utterly solitary males. Occasionally, males fight for dominance, but generally they avoid violence. Birute Galdikas, after many years of studying orangutans in the wild, concludes: "Individual orangutans rely on no one other than themselves. They have been released from dependence on others of their kind. Paradoxically, they seem to have an inner strength and serenity no member of any gregarious species, including our own, could ever match." Are these our primal forebears? If so, we would have to agree with Rousseau that we have descended from peaceful, asocial beings, who were free and equal in being "released from dependence on others." But notice that while these orangutans are solitary, in the sense that most individuals spend most of their time alone, they are also loosely social, in the sense that they show a social organization. Mothers caring for their offspring constitute a social unit. Actually, even Rousseau admits that maternal care for children would be required in the state of nature. Furthermore, the most recent studies of orangutans in the wild have shown a much more elaborate social structure than was previously reported. This new research is surveyed in Carel van Schaik's Among Orangutans: Red Apes and the Rise of Human Culture (Harvard University Press, 2004) and in Orangutans: Geographic Variation in Behavioral Ecology and Conservation (Oxford University Press, 2010), edited by S. A. Wich et al. 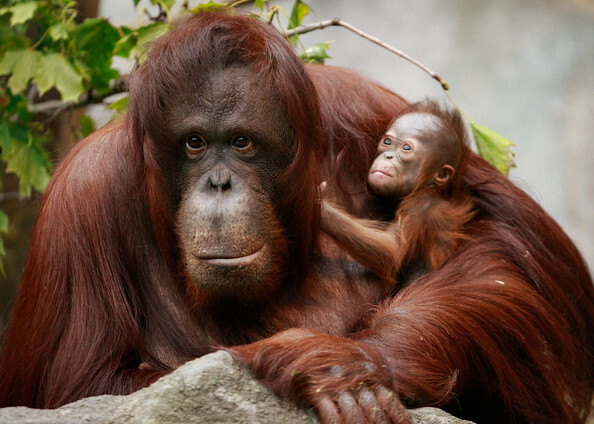 The strongest social bond among orangutans is between mother and offspring. She nurses the child for at least seven years, and even after weaning, the child will stay close for a year or two. Orangutans live in loose communities organized around a dominant adult male who is intolerant of other adult males. Adult females prefer to mate with the same dominant male, who might provide her protection from infanticidal attacks by subordinate males. The younger subadult males and females often travel together and play with one another. Mature females tend to settle close to their mothers and sisters. This social life allows for social learning that creates cultural traditions that distinguish orangutan communities. Various skills (such as tool use and building nests) and communication signals seem to be passed from generation to generation through social learning. A list of cultural variants found in orangutan communities can be found here. Consequently, we can say that all of the great apes are social animals, including the orangutans. And, therefore, there is no way to defend Rousseau's view of the state of nature as an utterly asocial state by interpreting it as a depiction of life among our ape ancestors. 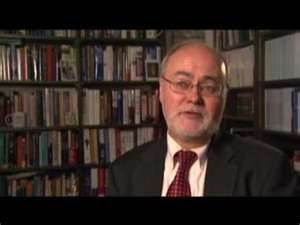 Roger Masters is one of the leading scholars of Rousseau's political philosophy. He says that once he began studying the biology of primate social life, he realized that what Rousseau says about the state of nature is simply false (see his chapter in Stephen Dilley's edited book--Darwinian Evolution and Classical Liberalism). The lack of evidence for such an asocial state of nature makes one wonder why Rousseau adopted such an idea. One possibility is that he was following the account of human evolution set forth by Lucretius, who begins with a solitary state without families (On the Nature of Things, book 5, 925-1010). But if we throw out this first stage of "nascent man" (141), the later stages that Rousseau sketches are more defensible: "nascent society" with the development of family life (150), "nascent inequality" with the development of agriculture (156), and "nascent government" with the development of political societies (162). This will be the subject of my next post. My argument for Darwinian natural right originated as a response to what Leo Strauss had said in his Introduction to Natural Right and History. Strauss explained: "natural right in its classic form is connected with a teleological view of the universe. All natural beings have a natural end, a natural destiny, which determines what kind of operation is good for them." This dependence of natural right on a teleological view of the universe was clearly seen by Aristotle, Strauss explained. The "problem of natural right" today is that "modern natural science seems to have refuted teleology." I agreed with Roger Masters that Strauss was wrong to suggest that the question of teleology depended on physics or astronomy, because Aristotle's teleology was primarily biological, and so the question was whether teleology is necessary for explaining living nature, and whether modern Darwinian biology supports such a teleological explanation of organisms. My answer to this question was that Darwinian biology really does support Aristotelian teleology. My thinking here was decisively influenced by my reading of Allan Gotthelf's dissertation at Columbia University--"Aristotle's Conception of Final Causality" (1975)--and some of his other writing (see my Darwinian Natural Right, 238-43). I was persuaded by Gotthelf that Aristotle's final causality is best interpreted as living nature's irreducible potential for form: the development, structure, and functioning of a living organism manifest the actualization of its potential for organic form, an actualization that depends on, but is not reducible to, the natural potentialities of its material elements. Moreover, far from refuting Aristotle's teleology, modern Darwinian biology provides an evolutionary explanation for living nature's irreducible potential for form. I was pleased, therefore, to see that Oxford University Press has recently published a collection of Gotthelf's papers on Aristotle's biology--Teleology, First Principles, and Scientific Method in Aristotle's Biology (2012). Although I have read most of these papers in their earlier versions as articles, I had not read the two papers at the end of the book--"Darwin on Aristotle" and "Aristotle as Scientist: A Proper Verdict." These remarkably brilliant papers reinforce my response to Strauss by showing that Aristotle's teleological biology was an empirically based science, and that this teleological science is deepened by modern Darwinian science. For me, this provides the biological solution to Strauss's "problem of natural right." But while my motivation for formulating the idea of Darwinian natural right came mostly from my reading of Strauss, Gotthelf's motivation came from the influence of Ayn Rand. As a college student, he came under the spell of Rand from reading Atlas Shrugged. He met and talked with Rand, and he shared her enthusiasm for Aristotle as the greatest philosopher for explaining the rational basis of human existence as part of the natural world, without any need for a Platonic transcendence of nature. "For Aristotle, life is not an inexplicable, supernatural mystery, but a fact of nature. And consciousness is a natural attribute of certain living entities, their natural power, their specific mode of action--not an unaccountable element in a mechanistic universe, to be explained away somehow in terms of inanimate matter, nor a mystic miracle incompatible with physical reality, to be attributed to some occult source in another dimension. For Aristotle, 'living' and 'knowing' are facts of reality; man's mind is neither unnatural nor supernatural, but natural--and this is the root of Aristotle's greatness, of the immeasurable distance that separates him from other thinkers. "This is the source of Aristotle's intense concern with the study of living entities, the source of the enormously 'pro-life' attitude that dominates his thinking." This points to Rand's biocentric conception of ethics--that value exists only for living organisms, because it is only for living entities that existence is an achievement--an end or goal--that requires securing the conditions for one's existence and avoiding the threats to one's existence. Only for living organisms does it makes sense to say that some things are good for them and other things bad for them. Thus it is that we can speak of what is naturally right or desirable for human beings as that which conforms to their nature in securing the conditions for their life. Wanting to understand this Aristotelian and Randian conception of biological teleology, Gotthelf decided to study under Randall at Columbia University, where he could write his dissertation on Aristotle's biology, while being close to Rand in New York City. On the fiftieth anniversary of the publication of Darwin's Origin of Species, John Dewey delivered a lecture on "The Influence of Darwin on Philosophy," in which he argued that Darwin exerted his greatest influence on philosophy by refuting Aristotelian biology. But on the centennial anniversary of Darwin's Origin, Randall delivered a lecture on "The Changing Impact of Darwin on Philosophy." Contrary to Dewey, Randall concluded that, as a result of Darwin's influence, "nature is once more for us, as for the Greeks, full of implicit ends and ideals." Randall argued, "When Darwin led men to take biology seriously once more, they had to reintroduce these functional concepts that physicists had forgotten--means and ends, function, teleology, and time." Gotthelf elaborated Randall's thought in a long intellectual career devoted to studying Aristotle's philosophy of biology. Along with David Balme, James Lennox, and a few other scholars, Gotthelf has stirred a renewed interest in Aristotle's biology. The intellectual fruitfulness of this research is illustrated in the last two papers at the end of his new book. In "Darwin on Aristotle," Gotthelf shows how Darwin recognized Aristotle's greatness as a biological scientist, and perhaps, in particular, Darwin recognized some anticipation of his own understanding of biological teleology in Aristotle's writings. A few months before his death in 1882, Darwin received from William Ogle a copy of his new translation of Aristotle's Parts of Animals. As early as 1838, Darwin had written in a notebook a list of things "to be read," which included "Read Aristotle to see whether any my views very ancient." Many years later, in a letter dated February 12, 1879, he confessed his shame that he had never read Aristotle, but he wrote: "From extracts, which I have seen, I have an unbounded respect for him, as one of the greatest, if not the greatest observers, that ever lived." And, indeed, as Gotthelf indicates, many of the books Darwin read contained references to and quotations from Aristotle's biological works. But it was not until he received Ogle's translation that Darwin read Aristotle for himself. "You must let me thank you for the pleasure which the Introduction to the Aristotle book has given me. I have rarely read anything which has interested me more; though I have not read as yet more than a quarter of the book proper. From quotations which I had seen I had a high notion of Aristotle's merits, but I had not the most remote notion what a wonderful man he was. Linnaeus and Cuvier have been my two gods, though in very different ways, but they were mere school-boys to old Aristotle.--How curious, also, his ignorance on some points as on muscles as the means of movement--I am glad that you have explained in so probable a manner some of the grossest mistakes attributed to him--I never realized before reading your book to what an enormous summation of labour we owe even our common knowledge. I wish old Aristotle could know what a grand Defender of the Faith he had found in you." Unfortunately, Darwin died two months later (April 19), without leaving any evidence that he had read more of the book or any explanation of what exactly he found so exciting in what he had read. Gotthelf points out, however, that if Darwin read "a quarter of the book proper," that would include Ogle's Introduction and the first book of the Parts of Animals, in which Aristotle writes about his teleological explanation of animal parts and animal classification. Gotthelf speculates that what excited Darwin in his reading of Aristotle was seeing that he and Aristotle were in basic agreement about biological teleology. If so, this would contradict Ogle's understanding of the question of teleology. In his Introduction to his book and in an earlier letter that he had written to Darwin, Ogle set up a fundamental contrast between teleology and mechanism, with Aristotle and Plato on the side of teleology and Democritus and Darwin on the side of mechanism. In his Introduction, Ogle wrote: "One group of philosophers there was, who fancied that they found an adequate cause in the necessary operations of the inherent properties of matter; while another sought a solution in the intelligent action of a benevolent and foreseeing agent, whom they called God, or Nature, as the case might be." "But, contrary to Ogle's sentiment, Aristotle's natures are not literally intelligent, not literally planners, and arguably the philosopher's genius lies in plotting a third course between these two pictures, and defending it as scientifically legitimate. This third course involves the postulation not of an 'intelligent Nature' but of inherent natures--that is, of natural capacities (in Greek, dunameis) directed at form, irreducible to the capacities for the production of a living organism of a particular type that are irreducible to the capacities of the elements that constitute such an organism. From that perspective the isomorphism with Darwin becomes clear, and there is some evidence that Darwin himself saw it" (367). Darwin seemed to recognize the teleological character of his evolutionary science. In an article in Nature, Asa Gray wrote: "let us recognize Darwin's great service to Natural Science in bringing back to it Teleology; so that instead of Morphology versus Teleology, we shall have Morphology wedded to Teleology." In response to this, Darwin wrote to Gray (June 5, 1874): "What you say about Teleology pleases me especially and I do not think anyone else has ever noted that." So, we can infer, Gotthelf suggests, that when Darwin read Aristotle's explanation of biological teleology, he saw that he really was bringing back into science a teleological conception of living nature that was originally formulated by Aristotle. "These are the conclusions of a theoretical scientist, a student of nature. Were Aristotle to reappear tomorrow and be presented with the results of the last several hundred years of biochemistry and evolutionary theory, including the evidence with grounds them, my view is that (after recovering from the most awe-filled experience of his life) he would surely retreat from his insistence that the directiveness in nature is a primitive directiveness and the adaptiveness in nature a basic fact. Facts they would remain, but they would, for him, as for us, no longer be basic. The determination of what the basic level of explanation is, is for Aristotle ultimately an empirical or scientific matter" (392). Here then is the solution to Strauss's "problem of natural right": modern natural science has not refuted natural teleology, because, on the contrary, modern Darwinian biology provides the ultimate explanation for the goal-directed nature of organisms, including human beings, which thus sustains the teleological ground for the idea of natural right. Some of these points are elaborated in some previous posts that can be found here, here, here, here, here, here, here, here, here, here, here, here, and here. I was saddened to learn, shortly after writing this post, that Gotthelf died a few days ago. I did not know him personally. But I will remember him for a body of intellectual work that has helped me think through some of the deep questions indicated in this post. Abraham Lincoln and Charles Darwin share more than just the coincidence of being born on the same day--February 12, 1809. In a series of posts over the years--many of them posted on February 12th--I have argued for at least seven points of similarity between Darwin and Lincoln. (1) Both saw the universe as governed by natural laws, which included the natural laws for the evolution of life. (2) Both were accused of denying the Biblical doctrine of Creation. (3) Both spoke of God as First Cause. (4) Both appealed to the Bible as a source of moral teaching, even as they also appealed to a natural moral sense independent of Biblical religion. (5) Both abhorred slavery as immoral. (6) Both were moral realists. (7) Both were classical liberals. This fall, John Barr is teaching a remarkable course at Lone Star College-Kingwood entitled "The Emancipators: Abraham Lincoln, Charles Darwin, and the Making of the Modern World." Here's the course description: "On February 12, 1809, Charles Darwin and Abraham Lincoln were born, although in vastly different circumstances. They both had a profound impact on their respective countries, and indeed the entire world. In many ways, the world is still struggling with the legacy of their lives and thought. This course will examine the lives and ideas of Darwin and Lincoln (and their critics) through reading, discussion, essays, film, and literature. 'The Emancipators' is what the historian Jill Lepore once called a 'microhistory.' It is premised on the idea that these two men's lives were exemplary insofar as they serve 'as an allegory for broader issues affecting the culture [and world] as a whole.'" There are four required books for the course: James Lander, Lincoln and Darwin: Shared Visions of Race, Science, and Religion (SIU Press); Charles Darwin, Evolutionary Writings (Oxford University Press); Abraham Lincoln, Selected Speeches and Writings (Library of America); and James H. Jones, Bad Blood: The Tuskegee Syphilis Experiment (Free Press). Professor Barr is the author of Loathing Lincoln, a excellent book on the history of criticizing Lincoln and his legacy that will be soon published by LSU Press. Looking at his course syllabus makes me wonder whether he should write another book--Denying Darwin--on the history of criticizing Darwin and his legacy. I will be lecturing at Lone Star College on October 10th, and so I'll be interested to talk with the students in Professor Barr's class. I am not sure whether the syllabus for this course is available online. But Professor Barr has agreed to send a copy to anyone who contacts him at John.M.Barr@lonestar.edu. I wonder whether this course is unique. Does anyone know about any other college course comparing Lincoln and Darwin? A few of my many posts on Lincoln and Darwin can be found here, here, and here. The best short study of the Declaration of Independence that I have ever seen is Michael Zuckert's "Locke in America: The Philosophy of the Declaration of Independence," which is found in his Launching Liberalism: On Lockean Political Philosophy (203-34). His reasoning here is also found in his Natural Rights Republic (13-40). One of his most insightful interpretive claims is that the six "self-evident truths" of the theoretical section of the Declaration can be understood as six stages in the history of politics. The first two truths are about the prepolitical or pregovernmental condition, in which human beings are equal and possess rights. The central two truths are about the making of government, in which human beings institute government by consent of the governed for the purpose of securing their prepolitical rights. The last two truths are about the response to unjust governments, in which governments are identified as becoming "destructive" of the rights that should be secured, and then the people have the right to "alter or abolish" such governments and to institute new governments. Thus, this history has "three moments--the state of nature, the formation of civil society, and the revolutionary moment" (229). Obviously, as Zuckert indicates, this history in the Declaration shows the influence of John Locke. Zuckert indicates that this history has been criticized as bad history. Human beings are never born into a state of nature as completely free and equal individuals, because they are always born into some structure of authority, including the authority of their parents and of the larger society in which they live. Consequently, we never see human beings making a government through a social contract. Zuckert deflects this criticism by insisting that this history of politics in the Declaration is not "a literal history of human politics," but is rather a "moral history." "It is in important senses a self-conscious fiction that presents moral and rational truths about politics but not the literal truth about history" (230). I disagree, because I think this political history as presented in the Declaration and in Locke's writing really is a literal history. Furthermore, I think the truth of this history has been largely confirmed by evolutionary anthropology. This supports my general claim that political philosophy is ultimately an empirical science, and particularly an evolutionary science of political history. Locke lays out a history of political evolution based principally on two sources--the books on the social history of the American Indians by Europeans who had lived in the New World and the Biblical history of politics in the Old Testament. This evolutionary history of politics is crucial for his argument that human beings are naturally equal in their freedom, that governments arise by popular consent, and consequently that unjust governments can be overturned by popular revolution. Locke recognizes two major objections to his reasoning. First, it is said that there are no historical cases of people who begin as free and equal and then meet to set up a government. Second, it is said that all individuals are born under a government to which they owe obedience, and thus that they are not free to set up a new one (ST, 100). In response to these objections, Locke does not say, as Zuckert suggests, that his history is not meant to be literally true, because it's a "moral history" or "a self-conscious fiction." Instead of that, Locke insists that there is evidence for the truth of his history. We can see among the American Indians and other hunter-gatherer groups how human beings originally lived without government. "In the beginning, all the world was America," and thus this was "a pattern of the first ages" (ST, 14, 49, 108). We can also see in the Bible and other records stories of how government first arose (ST, 101-112). In the original state of nature, human beings lived as hunter-gatherers--gathering wild plants and hunting wild animals (ST, 26-31). They did not have any formal governmental authority over them. Each person took the law into his own hands, as it were, exercising the "executive power of the state of nature," which was the power to retaliate against attacks and take vengeance for harms done to oneself or to one's own. The state of nature can be a state of peace when all or most people agree on the customary rules of behavior as enforced by informal mediation and arbitration. But it becomes a state of war when it falls into a cycle of revenge and feuding in which life, liberty, and property are so insecure that people seek out some formal system of law and government to keep the peace (ST, 6-14, 123-31). As I have indicated in some previous posts, the studies of hunter-gatherer bands by anthropologists over the past century and a half largely confirm Locke's account of the original state of nature. From a modern evolutionary perspective, we can see that for 99% of our evolutionary human history, we have lived as nomadic foragers, which thus constitutes the environment of evolutionary adaptation in which our human nature was shaped. Among the Bushmen in Southern Africa, Polly Wiessner reports, "all adult members of the society are autonomous equals who cannot command, bully, coerce, or indebt others." There is a "strong egalitarian norm that no adult can tell another what to do." "All people as autonomous individuals are expected to stand up for their rights," and so everyone has the right to enforce the social norms of the group by punishing those who violate them. Doesn't this sound like Locke's state of nature? Although they did not have a formal structure of governmental authority, hunter-gatherers did have some informal leadership by which prominent people could mediate disputes and lead them in war, but always constrained by the informal consent or resistance of the community. Eventually, these informal and episodic positions of leadership became formal and permanent as they moved to leadership by Big Men or Chiefs. So, for example the American Indian Kings were originally temporary war leaders (ST, 105, 108). This suggests that human beings really are political animals by nature, so that even in primitive societies without formal governmental institutions, there are natural propensities to political rule in that some individuals will be ambitious in seeking positions of informal leadership. But with hunter-gatherers, there is a strong resistance to anyone who tries to dominate over others in an oppressive way. This might be what David Hume had in mind in his essay "Of the Origin of Government," when he described how the "love of dominion" as rooted in the "principles of human nature" would motivate leaders in savage societies who get prestige from acting as dominant individuals, although this dominance would depend on the voluntary consent, or at least acquiescence, of the other individuals in the society. In this way, Locke's idea of "original contract" really does explain the primitive origins of law and government, although the later history of government has been decisively shaped by war and conquest. Originally, one man might have been a temporary war leader, but as the state of war became almost perpetual, the war leader might become a permanent chief or king with the authority to compel obedience to his rule. And thus, Hume concluded, the history of government has been a continuing struggle between liberty and authority. Locke recognized that the history of government is largely the history of conquest, and in wars of conquest, popular consent is ignored (ST, 175-96). But when government rules by force alone, without any authority from popular consent, that government can be overthrown whenever enough people are discontented and have sufficient courage and opportunity to rebel. People are naturally inclined to meet force with force, when they think they are being exploited by tyrants. People can always choose to rebel against their government. And when they do, they have "appealed to Heaven," which is to say, they have invoked the God of battles, just as Jeptha did in leading the people of Israel in war with the Ammonites, as reported in the Bible (ST, 240-43). As suggested by both Hobbes and Locke, the ultimate ground of the natural right to equal liberty is the natural inclination of human beings to use violence in retaliating against those who attack or exploit them. In the state of nature, everyone has the "executive power of the state of nature," so that each person can punish murderers, thieves, and others who disrupt the social order (ST, 6-13). Even when people are living under an established government, to which they have given up their natural executive power, they can still reclaim that natural power, if they think it is necessary to defend themselves against the attacks of individuals or the oppression of government. This history of government that is elaborated in Locke's writings and that is briefly stated in the Declaration of Independence is not a "self-conscious fiction," as Zuckert says, it's a literal history that's open to confirmation by evolutionary political anthropology. Some of my points here have been developed in other posts that can be found here, here, here, here, here, here, and here.